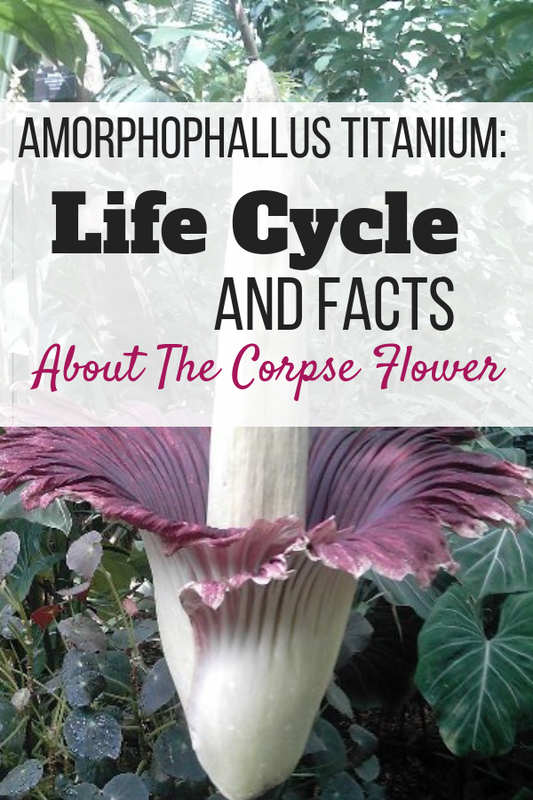 The Amorphophallus titanium, which has bloomed at both Fairchild Tropical Gardens and the University of Wisconsin-Madison in addition to other places, has made headlines year after year because of its enormous size and foul-smelling flowers as well as the rarity of seeing it in bloom! 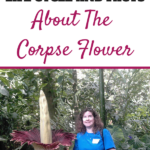 Due to the publicity and the rarity of the Amorphophallus titanium, many plant collectors all over the world wish to try their hand at growing this foul smelling plant also known as the corpse plant. 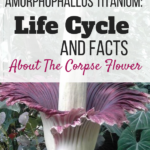 The Amorphophallus titanium has been recorded as blooming fewer than fifteen times nationally at the time of originally writing this article, however since then the blooms have become more common because more plants in cultivation at botanical gardens have started to reach maturity. Each time this plant blooms thousands of people stand in line to view this gigantic wonder. I was lucky enough during a visit to Olbrich Botanical Gardens in Madison, Wisconsin in June 2006 to see one in bloom. So, just what is the commotion all about and why is this particular plant making headlines? 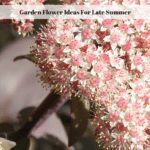 If you can get past the unmistakable stench of this unique plant when it is attracting pollinators, it is definitely one to try growing. Once the tuber has matured underground, it will begin to produce a huge aroid bloom that generally is taller than most humans. The spandex grows rapidly once it begins, although in the beginning the spadix will be completely enclosed by the spath and bracts. The average height of the inflorescence of this plant is six and a half feet, although the tallest one on record is a whooping 10.75 foot. 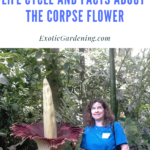 The Amorphophallus is considered to be the largest unbranched inflorescence in the world. It is difficult to propagate this particular variety of Amorphophallus because the tubers are prone to rot. It does not reliably increase its size nor does it produce seeds or offsets as easily as the other species of Amorphophallus. 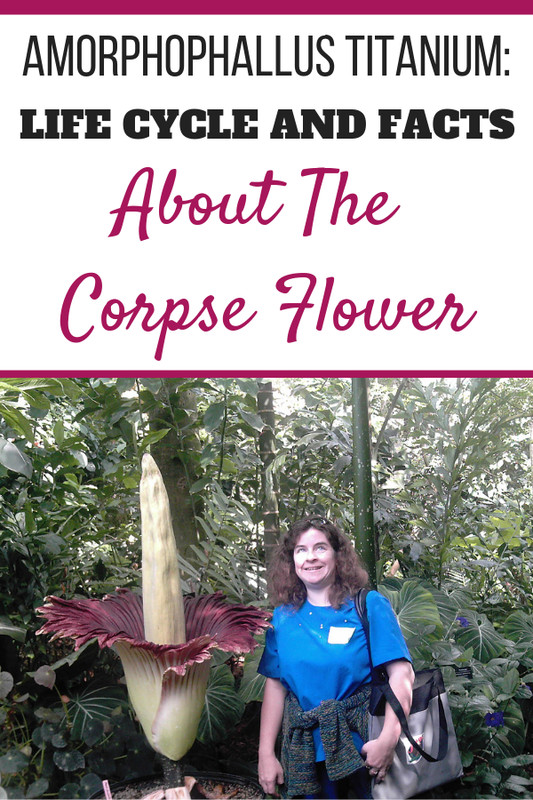 Another reason why Amorphophallus has a hard time reproducing is because the female flowers are the first to open. Before the male florets begin to produce their pollen, the female flowers are already unreceptive. In rare occasions in the wild pollination will occur only because of the fact that Amorphophallus can set bloom any time of the year. This allows for a slight chance that one plant may be in the female cycle while another has already entered into the male cycle. 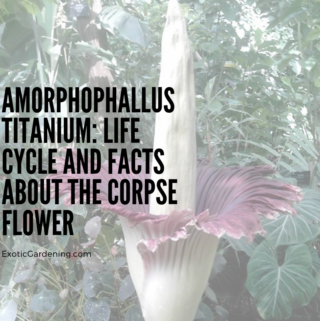 The Amorphophallus titanium plants in cultivation are normally hand pollinated, which is no easy task. Pollen must be taken from the male flower and kept viable until the female flower is receptive to receiving it. If you are lucky enough to receive viable seeds of the Amorphophallus titanium, the next step is to successfully germinate them. 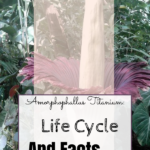 It is best to direct sow Amorphophallus seed in either the autumn if you live in a warm climate or in the spring once the temperatures are ranging in the sixty-six to seventy-seven degree Fahrenheit range. 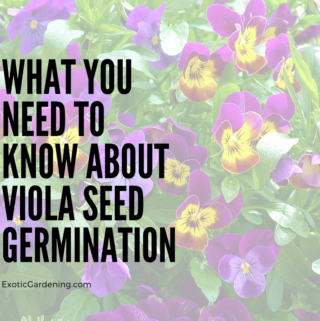 Of course another option is to use a heat mat to make sure the seed starting mixture you sow the seeds in maintains a constant temperature throughout the germination process. Sowing the seeds fresh is best for this plant. Another method of propagation is to separate the offsets that grow on the sides of the tubers, but be sure to do this when the plant is dormant. 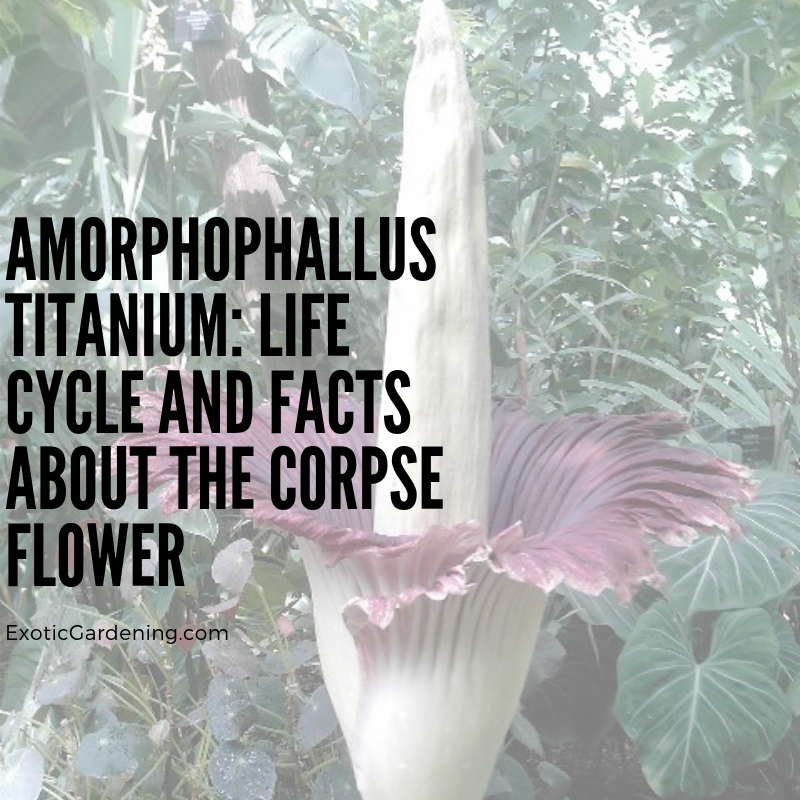 The dormant tubers of the Amorphophallus species should be planted in late winter or early spring in the ground where weather conditions are favorable for it to grow outdoors year round. For those who live in cold climates, plant the tubers in a pot and keep the pot indoors in a warm, draft free location. 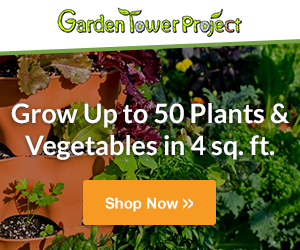 The tubers should be planted four inches deep, and grown in warm, barely moist conditions. During the active growth cycle, frequent watering that includes a balanced liquid fertilizer applied monthly is recommended. 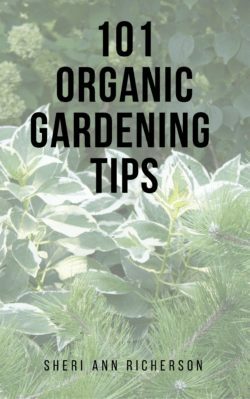 During the dormant season, allow the soil to dry or for better results, remove the tubers from the soil and place them in a paper bag in a dark, dry and warm place such as a closet. The larger the tuber is the greater the chance that the plant will bloom. Should you decide to try growing the Amorphophallus species be aware that spider mites will attack emerging seedlings. Aphids are also moderately fond of this plant. You should also note that low humidity or low light might cause the leaflets to partially desiccate. Of course, plants grown in low light have a dark green leaf with contrasting pink margins that is quite attractive. 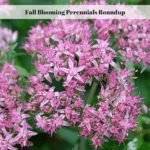 Once you move this plant into bright light will produce bright green leaves with pinkish margins that are less noticeable. Moving the plant from low light to bright light must be done gradually so the plant does not suffer from a sudden change in growing conditions. Of course anytime you have an unusually large or unique looking plant, there are old wives’ tales that go along with it. 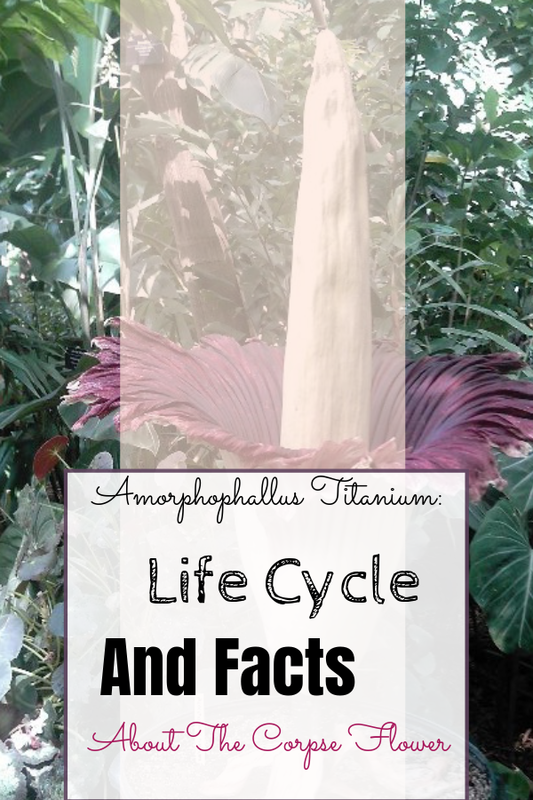 The Amorphophallus titanium was once rumored to eat its grower. 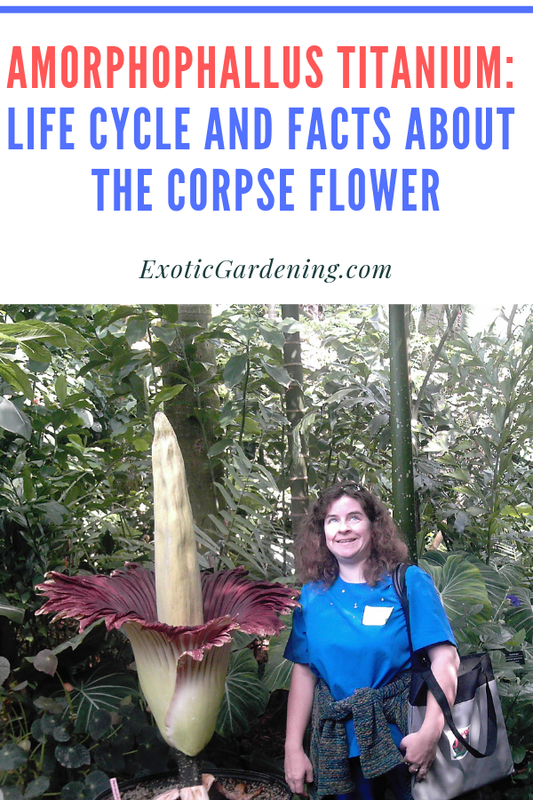 Of course, we all know today that that’s just an old wives tale, however I am sure this story was started due to the enormous size of the inflorescence and possibly even because some people fell into the plant and were unable to get out. Now, if the idea of a man-eating plant isn’t enough of a shock to you, try the idea of elephants pollinating the monstrous inflorescence! The truth of the matter is that large carrion beetles are lured by the horrendous odor of decaying flesh, or as one person puts it rotten liver! Indonesian people commonly call it bunga bankai, which means corpse flower, because of the horrendous smell that it puts off when it is ready to be pollinated. As mentioned briefly above, I was blessed to be in the right place at the right time when one of these gorgeous plants bloomed. The bloom actually happened right before the conservatory opened, but I was there during a press trip with the Garden Writers Association and thus was allowed inside the conservatory early. Standing beside the plant in bloom was beyond amazing. I did not notice a stench, but I do believe that is because the inflorescence had just opened and it was not ready to attract pollinators. 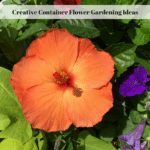 After seeing how large it actually was and being able to touch the plant as well as get an idea of the size of container it needed, it is still one of the many plants I want to grow in my own greenhouse. Of course, I was only able to spend a few minutes alone observing the plant before the doors to the conservatory opened and people started rushing in to see what this plant actually looked like in bloom. 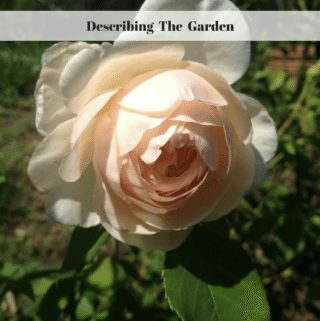 I will forever cherish the memory of seeing it in bloom for myself.